AROMATIC SUMAC - a medium sized, multi-stemmed non-suckering shrub reaching 5 to 6 feet in height and spread. Adaptable to dry, high pH soils. 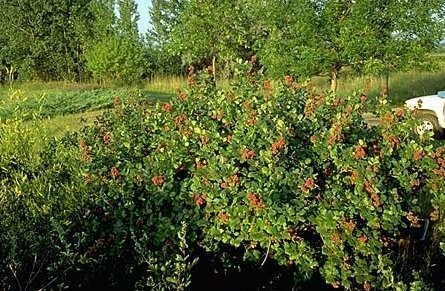 The trifoliate leaves are aromatic when crushed, dry fruit clusters are utilized by many bird species. 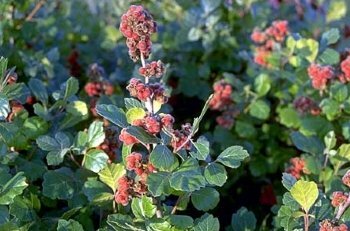 Native to the eastern and central U.S., best used in climatic zones 4 and warmer. Cultivar: 'Konza' - A USDA, Manhattan, KS PMC seed propagated selection reaching 6 to 10 feet in height. Attractive glossy foliage and good plant form. Climatic zone 5 and warmer.